On October 21, 2015 the Junior Sailing Association of Long Island Sound (JSA) awarded two of its seasonal perpetual awards, the Clinton M. Bell Trophy and the Thomas W. Fowler, Jr. Trophy, to the 420 team of Julia Reynolds and Hobi Lew of Pequot Yacht Club in Southport, CT. 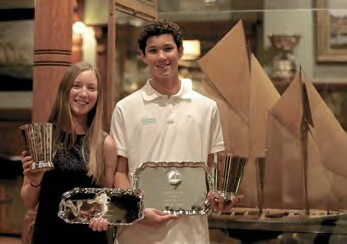 The awards were presented at the JSA general meeting at Larchmont yacht Club in Larchmont, NY. Both awards are for best finishes at JSA open events, which in 2015 included Larchmont Race Week, JSA Race Week and Eastern Districts. The Bell Trophy is for highest score in all junior boat classes, and the Fowler is for highest score in junior doublehanded events. This is the second year in a row that Reynolds and Lew, who teamed up in a Club 420 in 2014, have won both of these awards.